Discussion in 'The Gallery' started by DanGraves, Aug 28, 2018. The Damascus was made by me using 1084 and 15n20. 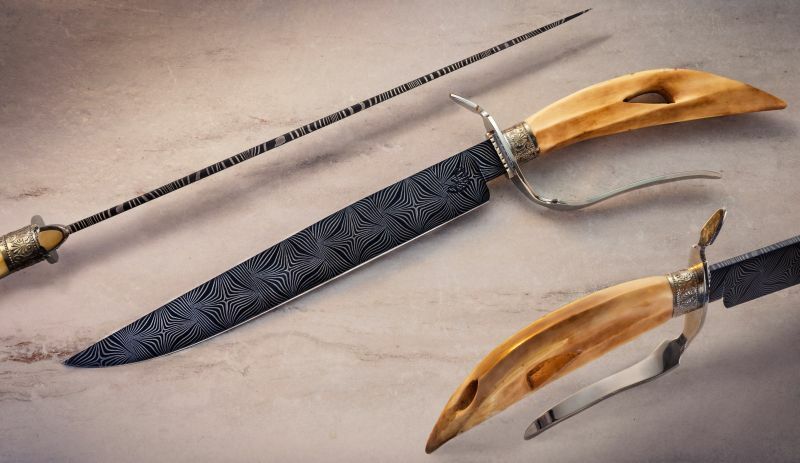 The Damascus was an interesting build as it had to be sliced into tiles and then welded to an 1/8 piece of steel plate then all welded together and then the process of grinding to clean Damascus steel. The handle is fossil walrus that was carved into a whale or walrus harpoon est. over a 400 to 2000 years ago by Siberian Eskimos (USA did not own it then hence the name Siberian as Russia owned Alaska which includes St. Lawrence Island). The handle has a "V" carved in it and that is for the leather rope and a hole on the back is where the spear attached (there is a piece that goes in the hole and then the spear but I can't recall the name). I hope all this is accurate but if not let me know. I have had these artifacts before but never one in this good of condition (really a museum piece). I felt it needed a guard like this for the flow of the knife. Blade length is 11 1/8 inches and overall is 18 1/8 inches. This is a big one. Hope you like it. Seesteel, 3fifty7, d.r.h. and 2 others like this. Amazing tile work, amazing piece altogether.